This early book carrier is a wooden handle attached to cloth straps. This type of carrier was used by children from the mid to later Victorian into the early 1900’s. The carrier is imprinted with the date of 1880. 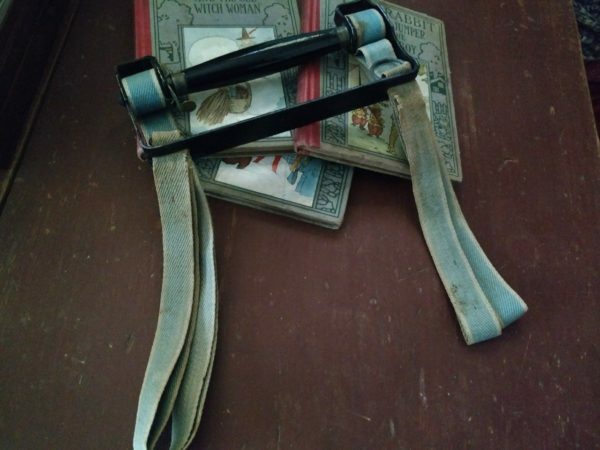 By placing a book, or books, between the loop of the straps, the handle was then turned, winding the straps tightly against the book and handle. A lock mechanism with metal tab, would flip to latch to secure the books for ease of carrying. To remove the books, the tab was released and the handle was unwound the opposite direction.